Ever since planting a row of rainbow chard in the early spring we have had three large harvests in our garden, making it a green our family is pretty familiar with aaaand a little tired of, given my boring use of it chopped in pastas and over breakfast eggs. One week ago I reached out on Instagram for some creative ideas on what to do with our latest batch, and the responses were wonderful! I decided to gather up all the beautiful ideas thrown my way to share with you all here. These also now a little easier to sort through here in my journal for future use in our kitchen since the leaves in our planted crop are about a third of the way towards reaching their maturity. This stuff grows fast! You should give it a try in your garden if you already don’t it really is delicious. Enjoy these ideas dears and thank you to all who shared your inspiration with me on IG. I am always grateful for those who take the time to inspire others. I put it in a hash with sweet potatoes, onions, and crumbled bacon or sausage and top with a fried egg. Sautéed with other garden veggies, topped with red sauce and cheese and baked until it’s bubbling, serve with crusty bread- mmmmm. Pesto with walnuts and salty sheep’s milk cheese. Bake greens in a tart. Roast the stems and put in a spring roll. Roast the stems and eat like french fries. Sweet Italian Chicken Sausage from Trader Joe’s, browned with some minced sweet onion and garlic. 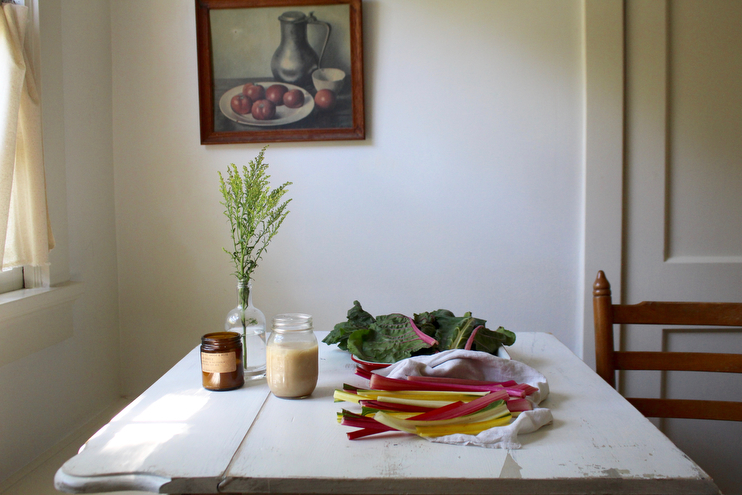 Chicken broth, heavy cream, and lots of fresh chard. Topped with parmesan and pepper. You can stuff them with rice-kind of like you would grape leaves. Green smoothies with 1:1 fruit and vegetable. Little pocket pies with fresh ricotta and Parmesan cheese! Served with tomato salsa and something cool and fizzy. Juice it with beets, carrot, cucumber, and ginger. Chard burritos: mexican rice, black beans, salsa, avocado, cilantro. Make tzatziki with it! Recipe on Tea and Cookies blog. I’ve made Smitten Kitchen’s pot pie recipe with it and it’s delicious. I use it in place of celery in my vegan chickpea salad (like chicken salad). 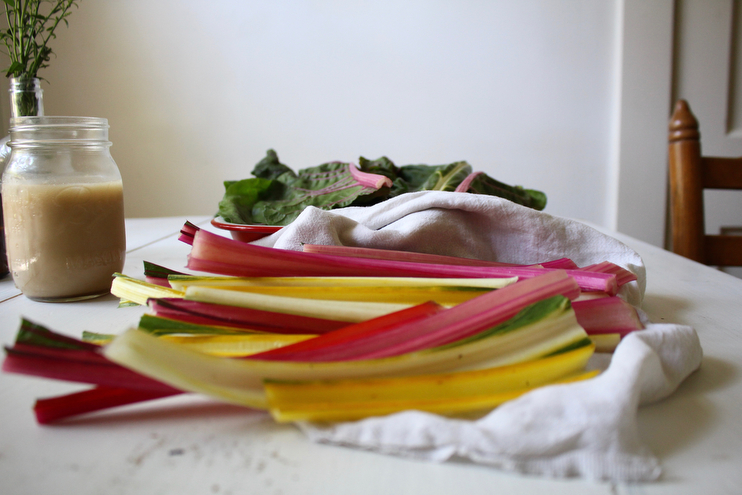 Love rainbow chard! There is a sweet corn and hard gratin from the NY Times that is to die for. Blanch and use for chard maki rolls! With avocado and pickled matchstick veggies. Blanch and freeze for smoothies or winter soups. Mix with sweet potato and goat cheese in quiche. Make a chickpea salad wrap and use the chard as your wrap. Eggs in a nest, Barbara Kingsolver’s recipe. Sauté with water and garlic, use as base for sauteed bean or tofu in one teaspoon peanut butter whisked in 1/8 cup tamari or soy sauce. Tomato, chard and Gruyere pie. Swiss chard “rainbow” risotto – stems and all! I love using them for sandwiches or salads. Super simple lentil curry- sauté an onion, cook black lentils with a can of tomatoes and a generous amount of curry powder (+salt to taste when lentils are cooked) then add as much chard as you can! Serve with yogurt and naan- went through many a chard bumper crop this way. Roast the stalks with garlic scapes or fresh garlic. 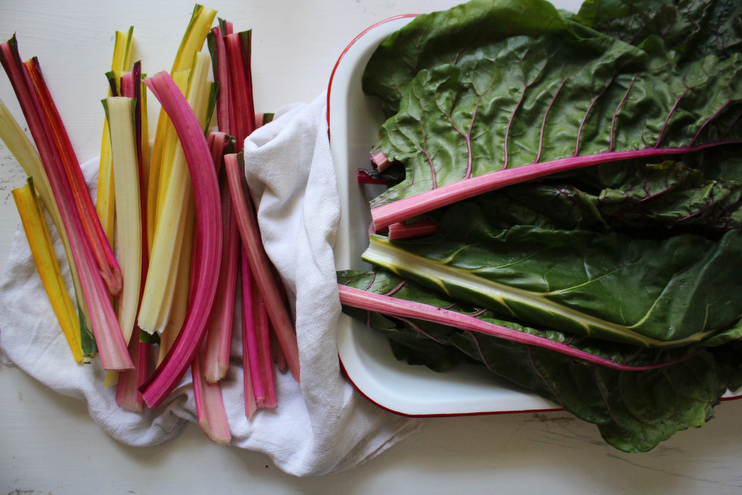 Chard wraps are the best! A super flavorful hummus with basically a whole bunch of dill or cilantro. Wrap in thin batons of kohlrabi, cucumber, radishes, or carrots! Chop up and sauté in a tiny bit of butter and add a splash of rice vinegar. When it turns bright green take it off the heat and eat ASAP! Just saw a lovely recipe on Dinner a love story for grilled Swiss chard on top of a piece of bread with feta! Sauté some shallots and garlic in butter and season with salt and pepper. Then, add the chard, torn in long pieces, some heavy thick coconut milk (or heavy cream if you can eat dairy), and even some curry and nutmeg if you like those flavors. Cook until the milk/cream is reduced/thickened and no longer watery; about 15 minutes. You can make chutney, jam, compote! It might be too hot for soup, but I love making Cookie and Kate’s West African Peanut Soup and using rainbow chard for the green. Sautéed with lots garlic and evoo and tossed with pasta is my family’s favorite. Great in a fritatta with feta but my fave is garlicky ribollata soup with chard (can add a little cavolo nero too) – soffrito with onion, celery, carrot, chard stalks bay parsley and thyme, then garlic for 2 mins, then tin tomatos, good chicken stock, borlotti or cannelleni beans and chard leaves done! Serve with parmesan, drizzle good olive oil and nice sourdough! I throw it in my curries and stir fry. Sweet potato and chard enchiladas. Lightly Sautéed in avocado oil with garlic and chipotle hot sauce and served with cauli rice or brown basmati rice, pinto or black beans and a crispy fried egg topped with avocado and pickled jalapeños. I love it creamed with Parmesan like you would spinach. We had it with a roast dinner the other day it was gorgeous! We blanched it- then we fried it with butter and a pinch of sugar, it was gorgeous and crunchy. Look for Monty Don’s video “Fork to Fork” /Leaves. His wife cooks up garlicky chard on crusty bread. And he has other fun garden produce videos too! I’m blanching and freezing today’s harvest! My favourite way to enjoy is just chopped up as a salad though. Epicurious’s swiss chard and mushroom galette is a bit involved for a weeknight but it’s delish. Chicken broth soup with small potatos, green beans, onion, tomatoes, and chard. With goat cheese and pickled beets. I steam and then drizzle with braggs and nutritional yeast or in the blender I whip up a little sauce of tahini, almond butter, apple cider vinegar, olive oil,yellow miso paste and a little bit of agave plus some water to thin it out a little bit. I blend all of it in the vita mix and drizzle over the chard. I always put chopped up chard in our marinara sauce for pasta or pizza. It’s a great way to sneak greens in. Sautéed with garlic and olive oil and red pepper flakes. Make a summer minestrone soup with some chicken/turkey meatballs and put some chard in at the very end to just wilt. I like to braise it with some garlic and stock in the oven. Make a cheese bechamel and mix the chard through it, makes a nice savory pancake. Blanch in stock then mix with mascarpone and pancetta, top with Parmesan and bake. Just curious, would you like to see more recipe posts like this? It’s more of a conglomeration of ideas to lead you in a particular culinary direction rather than a full-blown recipe, but perhaps you find this more helpful? I’d be interested to know! I also hope you landed on something to cook up for tonight’s supper. I love all the music on your snaps. I am the type of drain that loves music but never knows what to turn on. I would love to read post when you have the time talking about your favorite pandora stations, artists or records that make a fun and happy home! Oh how Gorgeous! I’m suddenly in the mood for some vegetable lasagna… I just might have to make some over the weekend and incorporate some lovely Swiss chard. I LOVE lists of ideas for greens as I’m always trying to incorporate more in my meals. And for me, I don’t always need a specific recipe as much as I need a thought about something new – to me – to do with an ingredient.